In fifty years together you've shared so many things. That's why this very special anniversary brings to you, a wish that love, laughter, joy, contentment too will be yours to share throughout the years ahead of you! Although fifty years have passed, some aspects of love will never change, they just become stronger through the smiles and tears. 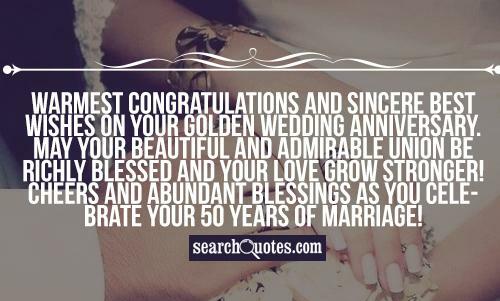 May this be a very special anniversary as you look back on all the happy memories you've shared in your marriage together. May the good Lord see and bless you, on your anniversary day. May He always be your companion, continuing to guide you from day to day. May your bonds of marriage stay strong amidst all fears. Let the love and friendship for one another withstand the spices that are challenges in today's troubled world. In fifty years together you've shared so many things. That's why this very special Anniversary brings to you, a wish that love, laughter, joy, contentment too. Will be yours to share throughout the years ahead of you! One by one each year flew by, Since you both said 'I do.' Forty years of memories, shared by the two of you. From big events and holidays. To simple daily pleasures, some tearful times along life's way, some joys that can't be measured...One by one each year now gone, but still they're yours forever...Each and every memory, of Fifty years together! Today as both of you look back with happiness and pride. Upon the fifty cherished years that you've spent side by side, may every memory that you share. Of dreams you've seen come true, help make this special Golden day. A happy one for you!